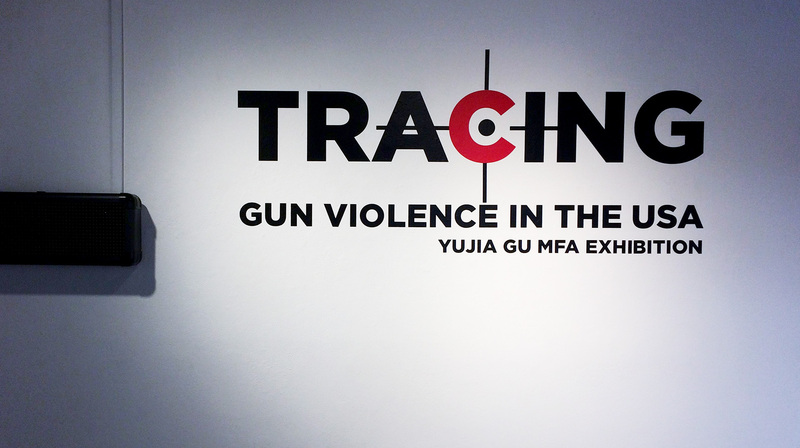 My student Rachel Palmer writing about Yujia Gu’s MFA Graphic Design thesis exhibition Tracing Gun Violence in the USA, in the School of Art’s Dutzi Gallery on 12 April 2017. Yujia Gu is currently at CSULB working on her MFA in Graphic Design. She is originally from Beijing, China, and a lot of her family remains there. She earned her BFA in Graphic Design in China, and after she receives her Masters degree, she may return to China. Before coming to Long Beach, she studied in New York for a few months. She loves to hike and go to various museums. She also has a love for photography, drawing, and painting. She was shocked when she came to the United States and saw all the problems that exist here with gun violence. She thought that her family had been exaggerating when they told her to be careful, but one look at the daily news cycle and she realized that they were not wrong, and these facts inspired her exhibition. The images and words Gu uses are meant to shock the viewer. 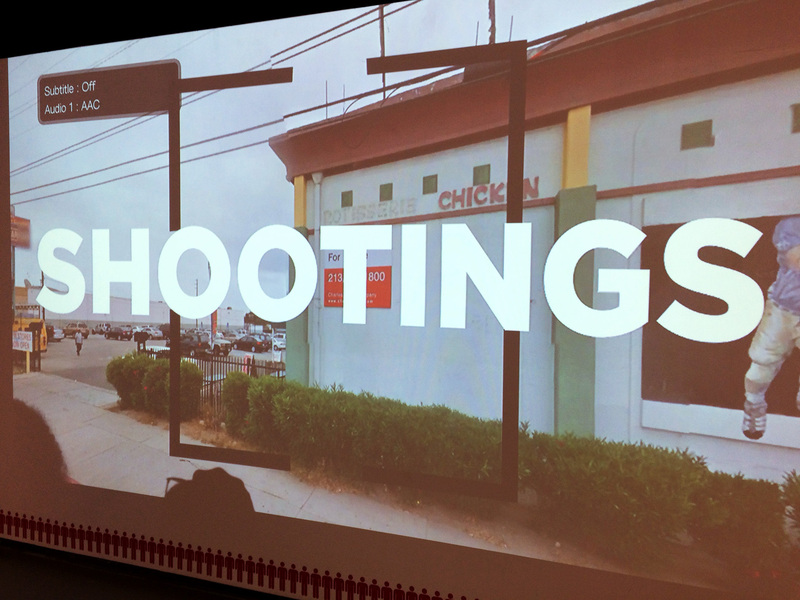 We tend to see these acts of gun violence as ordinary, everyday occurrences. Gu wants to bring awareness to these issues and call attention to why immediate action is needed. Her mother talked to her about international students being killed by gun violence and she became very worried. Gu realized just how serious this issue was when she realized her mother was right to worry. 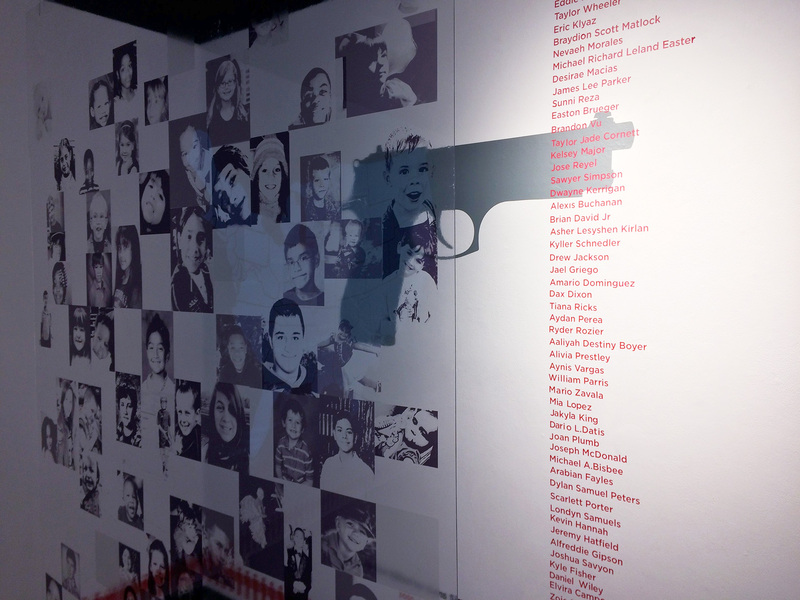 Her work emphasizes the numbers of people killed in each shooting with an LED light up display. The numbers of people that span the wall are the yearly death rates. As the viewer you are overwhelmed by the numbers of people, but also by their names and faces. Her answer to all the gun violence would be gun control. She knows it won’t be easy, but it is necessary. The way Gu uses the outlines of people we tend to see as more of a “statistic” next to real images of those killed and their names brought attention to Gu’s argument. It is easy to ignore the problem when we see people as a statistic, but when they have names and faces it becomes harder to ignore. With her projection of ordinary scenes, I think Gu was trying to say that gun violence can happen anywhere, even in our own neighborhood. With this acknowledgement that the people who have lost their lives to gun violence were just like us or our loved ones, the need for immediate change becomes stronger. Gu shows why we need to advocate for stronger gun laws and gun control. In other countries, like the UK, it is difficult to get a gun and sentencing for having a gun illegally is harsh. This makes it so guns are not a common place item, and therefore there is less violence. People in the United States complain about “having their guns taken away,” but in reality they only want the guns to protect themselves from others who have guns. 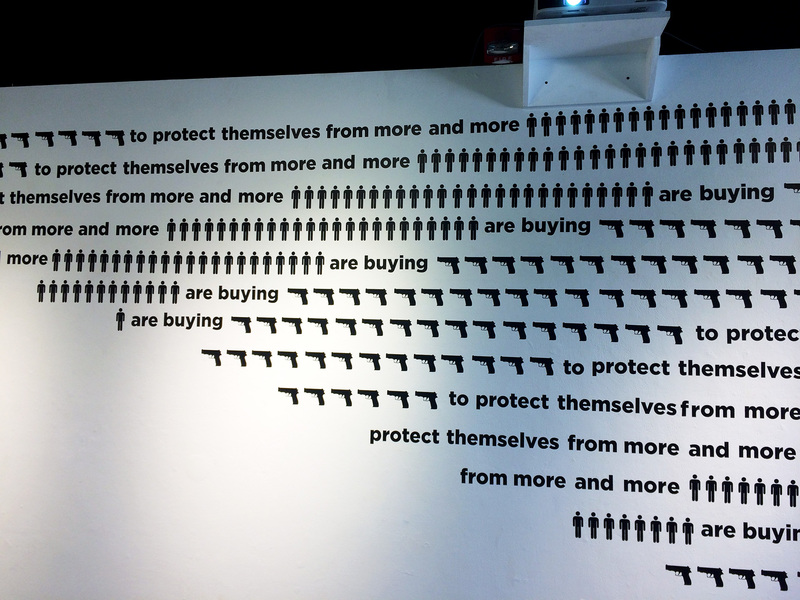 When you look at Gu’s exhibition, she points out this absurdity, that people buy guns to protect themselves form gun violence, and its a vicious cycle.